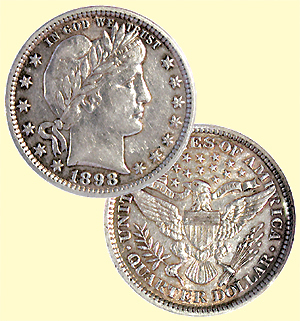 he silver coins minted from 1892 to 1916 were designed by Chief Mint Engraver Charles Barber. His initial "B" appears incused at the base of Liberty's neck. They replaced the long-running Seated Liberty design, which covered the span from 1836-91 and included denominations of 5 cents, 10 cents, 20 cents, 25 cents, 50 cents and $1 coin issues. The new designs featured the head of Liberty with a cap and wreath, with the word "LIBERTY" in the band across the cap. The quarter and half dollar featured a spread-winged eagle with a shield on its breast, an olive branch in one talon and three arrows in the other. A wavy band in the beak includes the motto, "E Pluribus Unum" ("out of many, one"). The reverse design matches in many ways the Morgan dollar of 1878-1921 in terms of details such as the olive branch and arrows. These coins circulated well into the 1950s and disappeared by the early 1960s. As a young collector in that period, I managed to fill 75 to 85 percent of each Whitman three-page folder with the coins of each denomination  usually well-worn grades found entirely in circulation, and missing most of the really tough issues. The dimes included some really tough issues to find, even in lowest grades. Today, these low-issue pieces sell for $50 to $200 each: 1892-S, 1893-O, 1894-O, 1895, 1895-O, 1896-O, 1896-S, 1897-O, 1901-S and 1903-S. The famous 1894-S dime had a mintage of only 24 pieces  and that is a story in itself. The current catalog value is $500,000. Not every one has been accounted for, so there is a remote chance one or more pieces reside in old collections. Low-grade, common-date coins sell for about $1, while in uncirculated condition (Mint State-60), the most common dates sell for at least $100. During the silver frenzy of the late 1970s and early 1980s  when silver bullion rose to $48 an ounce and common circulated silver coins were selling for 25 times face value  many Barber coins were tossed into the scrap heap for bullion (which, at the time, exceeded their numismatic value)  making today's pieces that much scarcer. The Barber quarters also featured some fairly scarce dates that have a catalogue value in the lowly state of Good-4: 1892-S, $15; 1896-S, $300; 1897-S, $20; 1901-O, $25; 1901-S, $2,000; 1913-S $475; and 1914-S, $55. In uncirculated condition (MS-60), common-date Barber quarters run about $175. Low-grade common-date pieces retail about $5. In "extra fine" condition they run about $75. The Barber half dollar follows a similar pattern of the quarter with scarce low mintages throughout the series. The key dates and catalogue values in low grade (G-4) include: 1892-O, $200; 1892-S, $125; 1893-S, $90; 1897-S, $100; 1914, $30; and 1915, $21. In MS-60 the lowest catalogue values are $385 to $500 for the most common dates. Common low-grade Barber halves catalog for $8 to $10. This is a great series to collect, since all of the pieces  except the 1894-S dime  can be found in most major auctions and in many fixed-price lists. The prices keep rising, but to a dedicated collector, the completion of a nice set of each denomination is a real challenge  and a joy to behold.